retreat days and concert performances. Write to Susan at susanwbailey@gmail.com for more information including samples of past appearances and references. 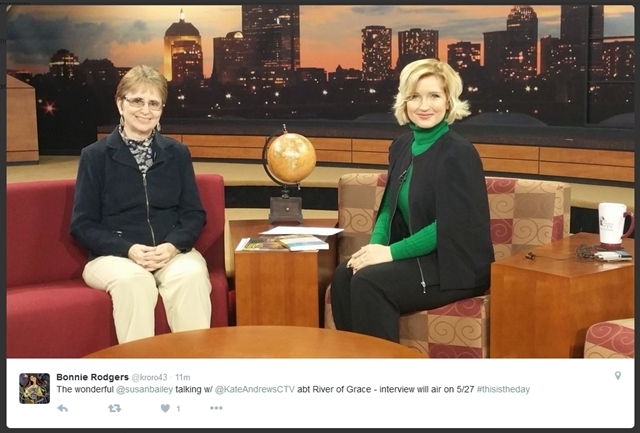 Wonderful interview on CatholicTV today — this explains better than anything just what River of Grace is all about! Still available on Amazon if you want a copy, especially during the month of November as we pray for our beloved dead. Thank you Kate and CatholicTV! We raised nearly $1000 for Haiti at my concert for the Blessed Mother. Everyone was so generous! It was a beautiful night of song and witness. It’s the first concert I’ve done since I got my voice back and it felt wonderful — truly grateful to God for such a privilege. Thank you to all who came. I was privileged to have my River of Grace discussed on Allison Gingras’ radio program on Breadbox Media, “A Seeking Heart” for the last 3 episodes! She used the first two programs to talk about how River of Grace impacted her own life — it’s such a blessing to hear that my book has impacted someone in such practical and powerful ways. In the third episode she invited me on-air to talk about my experiences of grace that inspired River of Grace. Sit back, relax and listen to how God surprises us with gifts of grace in even the smallest of ways! p.s. I am offering a free giveaway on the program — if you purchase River of Grace after listening, email me your receipt to susanwbailey@gmail.com and I’ll send you a PDF book of all the Flow Lessons included in the book – they include color pictures and links not included in the book. It’s an easy way to pick out the Flow Lessons you want to try. just got a fabulous review of River of Grace on Patheos by blogger Lori Erickson of the Holy Rover. I have been following this favorite blog of mine for years and am truly honored that she has reviewed my book! You can see the review here. “Susan Bailey’s River of Grace: Creative Passages Through Difficult Times tells of her spiritual journey after the deaths of her parents, the loss of her singing voice, and financial difficulties. During this time, she found solace and inspiration in kayaking the rivers near her home in Massachusetts. Her experiences while gliding along these waterways becomes the central metaphor for this lovely book about finding grace in hard times. I am grateful to Lori for her wonderful reviews. I invite you to read her blog on Patheos–Lori travels the world and documents many spiritual adventures (hence the title, Holy Rover). It’s a delight. 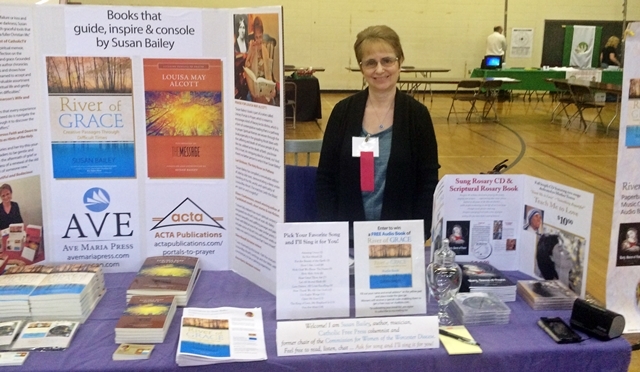 I was an exhibitor at the Springfield Women’s Conference in Springfield, MA where I had a chance to meet many lovely people and share my books and music with them. If you live in the New England area, consider coming to next year’s conference–it is a wonderful day of inspiring teaching, prayer and fellowship. Neophyte that I am, I learned some new marketing techniques that for me had a spiritual component. You can read about that here. My thanks to the wonderful women who produced this terrific conference! 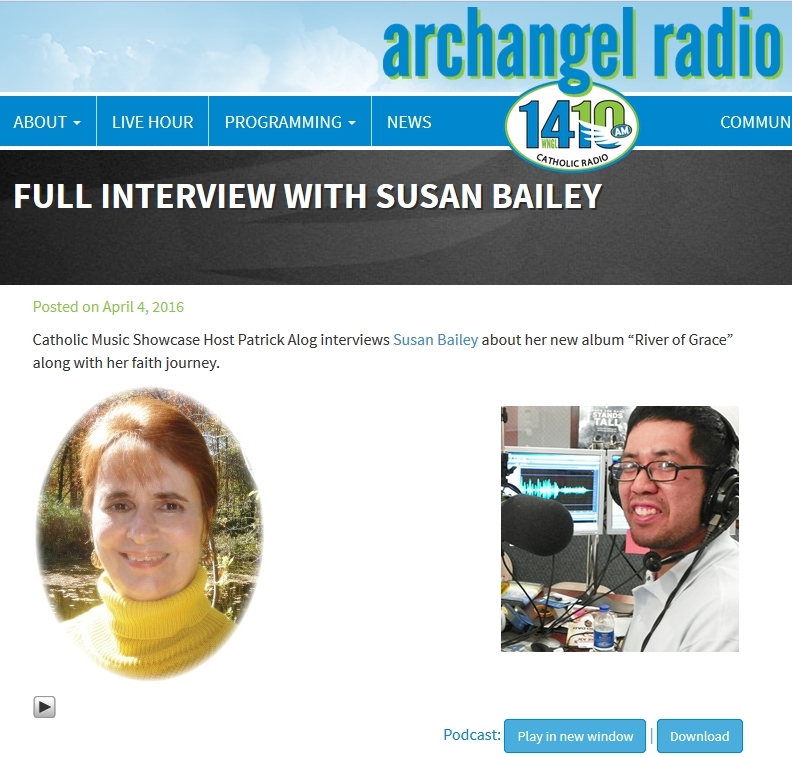 My interview with Patrick Alog of WNGL Archangel Radio for the Catholic Music Showcase is up! We talk about River of Grace and the River of Grace music soundtrack CD, and Patrick samples songs from the CD. Louisa May Alcott: Illuminated by The Message received a wonderful review on the Patheos blog by The Holy Rover, Lori Erickson. You can read it here. An exciting day in the studios of CatholicTV for a pre-recorded interview on “This is the Day.” I had the pleasure of speaking with Kate Andrews about River of Grace. The show is going to air on May 27th at 10:30 and will be available online on that date. I’ll send around a reminder before that date. Erin Franco of The Right Heart podcast and Humble Handmaid blog interviewed me for an hour regarding both River of Grace and Louisa May Alcott: Illuminated by The Message. We talked about all the key components including how to navigate through difficult times with a storehouse of spiritual treasures, Alcott as grief counselor and how creativity is a part of everyone’s makeup because of the presence of the Holy Spirit. Soon you will be able to hear it – stay tuned! I had the pleasure of presenting “A Journey Within: Seeing ourselves in God’s eyes by following the path of Jesus” to the lovely people of Our Lady of Good Counsel Church in West Boylston, MA. We enjoyed lively discussion, laughed, learned and prayed together. I incorporated music and videos including a wild roller coaster ride from Flow Lesson #15, “Take a Chance!” from River of Grace. Turns out Father Thirb, the pastor, loves thrill rides! I know many of you could not come but that doesn’t mean you have to be left out–you can listen to the entire presentation as part of a stay-at-home Mini Retreat for Lent, complete with all the music and videos I featured at the live presentation. I just completed a lively interview with Patrick Alog of WNGL Archangel Radio for the Catholic Music Showcase. He had me trace my faith life, highlighting the peaks and valleys and how music and writing figured in to a deepening of faith which guided me through the difficult times. We talked about River of Grace and the music CD which goes with it–Patrick is going to feature songs from that CD plus the very first song I ever recorded way back in 1993, “The Story in Her Eyes”–this was the song that started it all. The link will be available on March 14, stay tuned! I had a wonderful time with the Women of St. Luke’s at their annual Communion Breakfast at Tavolino’s in Westborough, MA. I gave a presentation entitled “Journeying Through Suffering and Grief on the River of Grace.” It was an uplifting talk on how life can become a joy-filled and exciting adventure even in the midst of grief as long as we trust in God and go with him willingly on that journey. We sang together and had fun! I had the pleasure of speaking with Wendy Wiese of Relevant Radio on her program, On Call with Wendy Wiese where we discussed River of Grace. We covered prayer, kayaks and rivers, Louisa May Alcott, healing as a result of St. Blaise and trusting in God through difficult times in our lives. I just had a wonderfully insightful interview with Matt Swaim of the The Son Rise Morning Show which is broadcast on Sacred Heart Radio and also carried on ETWN. I hope to have the audio soon–this was the best discussion yet about River of Grace. Matt’s understanding of grief as a process (and a long one) tapped into the core of the book. My thanks to Matt Swaim for a wonderful interview! I had a chance to speak with Deacon Tony on his morning program on Iowa Catholic Radio about River of Grace. He asked wonderful questions about the nature of grief and we discussed how it leads to new life. Thanks to Iowa Catholic Radio for the pleasure of this interview! I got to present on one of my favorite topics at Blessed Sacrament Parish in Westfield, MA – “How Advent Saved My Christmas.” Along with sharing stories of how immersing myself in the stillness of Advent healed me and helped me enjoy Christmas again with a childlike heart, I sang several selections from my Advent CD, Wait with Me. My thanks to Mary Federici for the invite and Brunhilde Luken for the referral. The official launch for Louisa May Alcott: Illuminated by The Message took place at The Barrow Bookstore in Concord, MA, home to the Alcotts. In fact, the building housing the store is owned by descendants of Louisa’s older sister Anna! How poetic to present on Louisa May Alcott and share lengthy conversations with fellow Alcott enthusiasts. Both Louisa May Alcott: Illuminated by The Message and River of Grace were received with enthusiasm. My thanks to Aladdine Joroff for the invite. Such a privilege to be featured for an entire hour on An Engaging Faith with Elizabeth Reardon on Breadbox Media. We covered a lot of ground regarding River of Grace and also got into Louisa May Alcott: Illuminated by The Message on its release day. Up bright and early for this one! Dynamite interview regarding River of Grace with Jon and Jeanne in the Morning in Iowa Catholic Radio. They played a cut from the River of Grace CD too. These two did their homework! I was pleased to have a book signing with music at the premier Catholic bookstore in our area, Boucher’s Good Books in Worcester, MA. Thanks to all the friends who came out to buy River of Grace and chat! Here’s where you can find the book in the store. How cool to appear at the Local Author Fair in the library of my former hometown! The Westborough, MA Public Library sponsored its first Local Author Fair and approximately twenty authors turned out. A pleasure to meet fellow writers along with readers of River of Grace. Thank you for coming out! I had a wonderful time speaking with John Harper of the Morning Air program Relevant Radio about River of Grace. He even played a song from the River of Grace CD! John was well-prepared and asked great questions. Want a quick summary of the book?